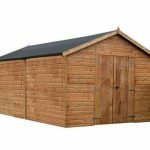 The 8’ x 6’ Budget Apex Overlap Garden Shed is a basic shed, with a basic structure and simple features. If you are looking for a simple storage solution in a high quality shed without the fuss, then this may be the shed for you. You might also like to see the top 20 garden storage sheds currently on sale in the UK by visiting the WhatShed garden storage sheds awards league table. This 8 x 6 garden shed has overlapped cladding, which allows the building to be more resistant to rainwater and the accompanying rot that comes along. The dimensions of the shed make it spacious, and you have solid sheet wood in the roof and floor. It’s a sturdy building. Baltic wood runs throughout the building, and this wood is grown slowly and is denser than normal timber. The entire building carries a useful 10-year anti-rot guarantee, which ensures that you have peace of mind when you buy. 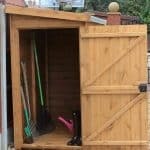 This medium sized shed will enable you to store all of your outdoor and garden tools and accessories with ease. There is the possibility of creating additional storage space by using built-in or freestanding shelving. This, in turn, allows you to create an organised storage facility that maximises both the floor area and height of the shed. The Overlap garden shed is a great storage solution within the budget shed range. With less fussy details and unique features but the high quality construction and build of a more expensive shed, this model is fantastic for those looking for simplicity at its best. 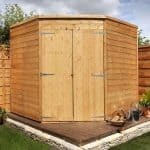 In this section we have a further look at what the Apex Overlap shed has to offer and discuss how it may be used in everyday life to store your outdoor and garden equipment. Exterior: The shed is constructed from Baltic source pine with 7mm overlap cladding, giving the structure a high quality and traditional feel. Fully weatherproof against the elements, the tough timber exterior will protect the interior contents all year round, whatever the weather. Interior: The shed offers many possibilities to organise the 8’x6’ interior as you wish by creating additional storage space with built-in or freestanding solutions. Using this type of storage for smaller tools and accessories will in turn free up the floor area for those large pieces of equipment you wish to store. Door: The single-size door is placed centrally to the front of the shed and allows easy access to the equipment inside. When open, the door frame width gives a good overview of the contents inside and in-turn provides easy accessibility when storing and removing items from the shed. Security: The shed door has a turn button to keep the door firmly shut whilst not in use. Further shed security options are available during the purchase process, including a shed alarm kit or a steel hasp and padlock. 8’ x 6’ Budget Apex Overlap Garden Shed: How easy to build? The Budget Apex shed will arrive directly to your door in flat-packed form with all of the pieces required for an easy assembly. Timber panels, roofing, fixtures and fittings will all be provided and a basic set of tools will be needed for the assembly process. It is recommended that two people assemble the shed together, for both safety reasons and time efficiency. 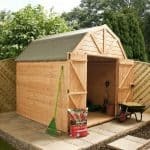 We expect that, with a basic understanding and experience of DIY, the shed could be standing in your garden within a few hours. 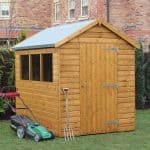 8’ x 6’ Budget Apex Overlap Garden Shed: What is the overall quality like? The Overlap Apex shed is an excellent example of how even the most basic shed can provide a high quality storage solution within your garden. The shed is constructed from Baltic sourced pine, which is notably a denser and stronger timber than domestic timber, meaning that the structure feels sturdy and of a high quality. The roof uses 8mm solid sheet board covered with sand felt to ensure it protects the shed throughout its lifetime. This product comes with a 10-year anti-rot guarantee on the provision that the wood is treated once assembled and then annually with a timber preservative treatment. It is recommended that the shed be placed on a firm, level base, such as wood or concrete, to create a solid foundation on which it may stand. If no such are is available within your garden, a range of shed bases are available to buy during the purchase process. The shed is provided in an unfinished timber, however, a range of wood colour treatments are available to purchase as an optional extra at a modest price. 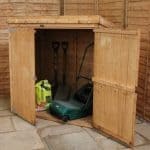 The 8’ x 6’ Budget Apex Overlap Garden Shed is ideal for those looking for a high quality, no-frills garden storage solution. This shed has a traditional appearance combined with quality timber construction to provide a structure that will last for many years to come. 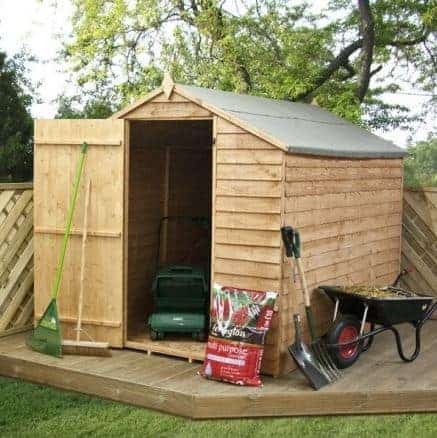 At this fantastic price, the shed provides a more than adequate storage space in which to organise your outdoor and garden equipment and subsequently keep your garden clutter-free.